This post may be all over the place so I apologize in advance if it is. I've been wanting to share this on my blog for some time now but at the same time, it's something I didn't want to talk too much about. This is somewhat of a touchy topic for me and it's different to deal with once it's public on the internet. This opens the doors for many people to criticize you and create their own opinions about you without even knowing you. Not many people know this about me unless you know me in real life or are a close friend of mine through social media. I've known for a while that I struggled with anxiety but it wasn't until summer of 2013 that a psychiatrist diagnosed with anxiety and depression. That summer I was at my absolute lowest and I knew I was in desperate need of professional help. During one of my weekly sessions with my therapist or psychiatrist was when I learned that I had been dealing with depression for over twenty years rather than five years like I thought. Let's go back in time to when I was starting kindergarten. 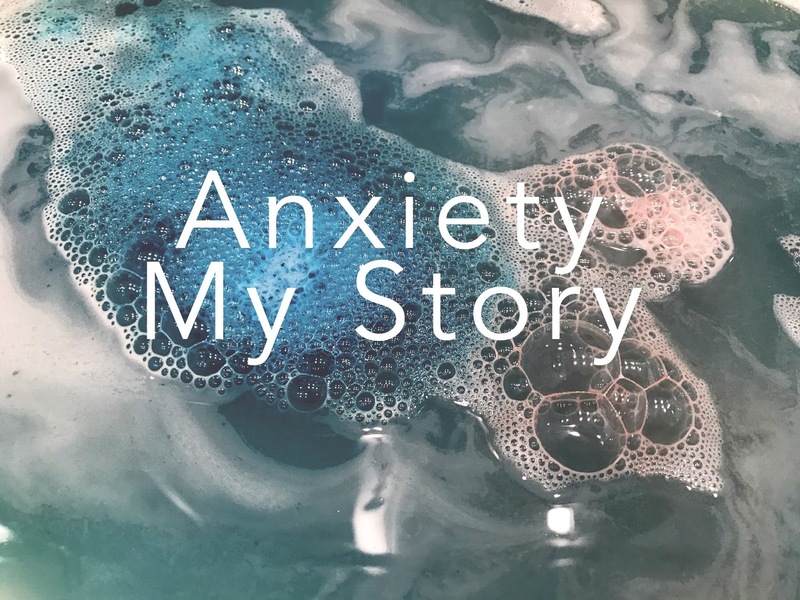 I'm going to share with you all my story with anxiety. Where it all started and how it affected me. I was four years old when I first experienced an anxiety attack. I know some of you are probably thinking, how on earth does a four-year-old child have anxiety? Well, I did and I learned from therapy that was because I was struggling with severe separation anxiety. I remember the day so clearly, it was my first day of Kindergarten and my mom took me to school. We were outside hanging out before class started. Once it was time for all the kids to say goodbye to their parents and enter the classroom I began to get extremely anxious and panicky. I remember panicking to the point that I grabbed my mom and wouldn't let go crying. I started screaming when the Teachers aid grabbed my arm to take me inside the classroom. My mom promised me that she wouldn't leave and that she would stay right outside the window watching me. That wasn't enough to comfort me. I didn't know what to do but cry. Once inside the class, I kept looking out the window to make sure my mom didn't leave me. It was so bad that once again the Teachers aid had to close the curtains to stop me from looking out the window and pay attention to the teacher. I still remember every single emotion I felt that day so vividly. It was definitely rough and didn't end there. My mom had to accompany me to school and stay by my side every single day of my Kindergarten year. This continued until first grade. As the time went by it got better and eventually, my mom didn't have to come to school with me anymore. Then I forgot all about that anxious feeling I used to get. It wasn't until I was starting middle school that those old feelings came back. This time it was different because I was much older and my mom couldn't be at my side all day anymore nor did I want her to. The beginning of sixth grade was incredibly tough on me I will never forget it. It was similar to kindergarten only a little worse. I was in a completely new school, unfamiliar, and it was a lot further from home. I didn't know anyone and felt extremely alone which was terrifying. I was so scared to where sometimes I felt paralyzed. I wanted to run screaming and hide somewhere, anywhere. I was really afraid of being alone, or left behind, especially forgotten. I had to take the bus to school by myself which was also very scary. I was always in fear if I were to miss the bus and could never get home. Or once I got off the bus if no one would be there waiting for me. I knew I had to be strong like always, and once again it got easier with time passing. After that year I never felt that feeling again and moved on with my life. Fast forward to 2008, I've graduated from High School and had my first job. It was a very normal day like any other. Nothing crazy or special happened. I was in the drive-thru with someone getting some food and while waiting in line I began to feel funny. I couldn't describe or pin point how I was feeling but I felt so strange. I started to feel like my throat was closing on me as if I was having some sort of allergic reaction, even though I've never had one so I don't know how that felt. I started to freak out and wanted to run screaming. I didn't know what was going on with me but I remember feeling like I wanted to rip my throat open so that I could breathe. I was trying not to think about it too much but you know how that goes. All of a sudden I was so tired. I felt exhausted and just wanted to lay down and rest. I just wanted to close my eyes, that was when I felt a little better and more relaxed. I had told my parents how I was feeling once I got home and when my dad saw me trying to sleep he told me not to in case I would stop breathing while sleeping. I think my parents made me feel worse, unintentionally of course. Because of them, I was getting even more anxious. My mom had walked to me and told me how I looked like a ghost because of how pale I was and began crying. Constantly trying to remain strong at that moment I broke down and I couldn't stop crying. I was panicking all over again and the ambulance was called. Once the paramedics took me to the ER I was there for what felt like forever. I remember the nurse hooked me up to machines and you could hear my heart beat which was driving me insane. I kept thinking what if the sounds stops that would mean my heart had stopped. Finally, once the Dr. came he had asked me some questions and told me I had a panic attack. He asked me if there was anything I was worried or stressing over, but there wasn't. It was a normal day like any other. There was no trigger. After that day I was constantly freaking out about everything. I never wanted to go out anywhere I wanted to stay home all the time. One time I was at the movies and the theater looked to have been a full house. I started to freak out again and felt claustrophobic which is weird because I'm not. I wanted to run out of there screaming. That was a pattern and felt it was the only thing that running away would solve my problem. The anxiousness lasted for a couple of months then became a horrible memory. I never wanted to back to that ever again. Now we're in 2013 and life seemed pretty good. Rudy and I were together going on a year and I had become a front end manager at the job I was at the time. Everything was going well, I would occasionally stress from the new position at work but it wasn't a big deal. One morning I woke up to stomach pains that went away that same day but made its way back a few weeks later while I was getting ready one morning for work. Regardless of the pain I still went into work in hopes that the pain would eventually subside, but it didn't. The stomach pains were painful and felt like a never ending stabbing pain on my right rib. During my first break at work, I asked my manager if the pain didn't go away if I could go home during lunch but he said no they needed me. Let me tell you guys this manager wasn't necessarily the kindest person. I felt stuck like I had no choice regardless of how much pain I was in I had to stay at work or else I'd get in trouble. Come lunch time the pain is still lingering so I just called my Dr and made an appointment. The pain lasted I want to say eight hours. It ended a few hours before my shift ended. When I had my appointment I found out I had a stone in my gallbladder and would need surgery to remove it. I'm sure that surgery isn't anything major but I had never had surgery before in my life so the thought really shook me. I was scared out of my mind but I put up a front and tried to remain strong. The moment I said goodbye to Rudy before being rolled to the operating room I almost broke down. Surgery went well and then it was time to recover. My surgeon had originally given me a week off from work but as the week was ending she extended it to another week because I was still very sore and could barely walk. I went into work to give my manager my Drs note and he gave me so much crap for taking another week off. He kept telling me how he was relying on me to be there because he needed the coverage and I was the only option. I had to open the store because the only other managers were taking the weekend off. The fact that I was still recovering from surgery didn't matter to him one bit. He even wanted me to ignore my Drs note and still come in even though I could have probably gotten fired if anyone found out about that. Regardless I know it shouldn't have but it really stressed me out. I hate disappointing people plus I couldn't help but think he's going to screw me over now. My first day back to work I felt extremely anxious and I really didn't want to be there. I wasn't ready to be back. My job was a very busy fast paced job and I knew it wasn't going to be easy on me. On top of that, I was scheduled to work a full eight hours and that worried me because I was sill moving really slow from surgery and still was pretty sore. I asked my manager if I could work a half shift too slowly get me back into things and he said no. I wanted to cry because I knew the pain I was feeling but I didn't have a choice I had to stay there no matter what. By the time I got home I was beyond exhausted and in pain! My incision was so sore I didn't know how I was going to survive another day like that. The following day I went to work for another full day. Still very sore I sucked it and tried to do my best. After my first break, I went back to work and ended up lifting something too heavy and ended up hurting my incision that I had to go home. It felt like I strained something and I had to go to the Dr. She gave me a couple of weeks off since she didn't want anything to open up. I tried to relax during the time I was home but I was stressing out about work. I was so scared to go back to work before I was physically ready and because I knew how upset my manager would be. That was all I could think of and on top of that, he kept bugging me about going back to work. A day or two before I was supposed to be going back to work I was out with a friend hanging out. Out of nowhere, I started to feel funny. My throat was starting to bother me and slowly felt like it was closing in on me. I started to feel very anxious as soon as I realized what was going on but I tried my hardest not to think about it. Once I got home that feeling didn't go away and ended up getting worse. I started to get extremely hot and sweaty. When I touched my face and chest I was cold. That was making me even more anxious then I noticed I was shaking and couldn't stop myself. I ended up calling to talk to a nurse and she gave me some tips to try and relax me in hopes that my anxiety attack would go away. She suggested for me to listens to calm instrumental music and lay on my left side. If things didn't get better but worse she told me to go to the ER. I tried doing what the nurse suggested and nothing was helping. I think I was already so far into my panic that nothing but time would bring me back. While on the phone with the nurse we scheduled an appointment for the next day with my Dr and I just kept thinking about the appointment. There I would get some answers and hopefully, that would help. My mom didn't want to take me to the ER and kept telling me to lay down and relax. This all started around eight or nine and lasted until three am. I kept trying to distract myself but eventually being so tired was what got me to calm down and eventually fall asleep. This was the worst anxiety attack I had ever experienced. From there on all the anxiety attacks I had felt like that some worse than others. Alright, I think this is where I am going to end this post since it's already ridiculously long. I wouldn't be surprised nor would I blame any of you if you choose not to read this. I mainly wanted to share my experience with anxiety, how it all started and how I felt while having one. I'm thinking of doing a part two and there I will continue from where I left off on this post. If you did read this thank you so much it was definitely the hardest post I've ever done. I know a lot more people than we think deals with anxiety. Maybe with this post, someone can relate to me. It's so strong of you to share this with us! You are inspiring people to open up and not be afraid to speak and ask for help. I can't wait to read more of your journey. I think many people can relate. Thank you! I don't think people should be afraid to ask for help. Once I did it was because I was done feeling the way I did. It really helped me so much. I too struggle with anxiety, had my first ever in feb 14 2013. Is amazing how so many of us struggle with it but don't open up to it. thankyou for sharing your story. Thank you, I think it's just something really touchy to talk about because so many of us are already so scare of the attacks. I know I felt sometimes that by talking about it or even thinking too much of it that it might cause an attack to happen. Thank you so much for reading. Thank you so much Natalie! It's such a scary thing especially when there is no trigger so you really don't know what to do in order to prevent it from happening again. I'm so sorry you had to go through all of that. Feel free to message me if you ever feel the need to talk or vent.